You need to regularly back up your Windows Vista files to a writeable CD or DVD or risk losing everything. Backing up files is a good computing practice, guaranteeing that you have a copy of all your work in case of a crash. Preventive maintenance isn’t just for cars. The computer is a mechanical device — hardware — and just like every mechanical device, sometimes things go wrong. You need to take the time to protect your data because sooner or later, every computer has problems. If you haven’t backed up your files, you could lose all your data and have to start over. 1Place a blank, writeable CD or DVD in your CD-ROM or DVD-ROM drive and then choose Start→Documents. You have to use a writable CD or DVD disc to perform the back up. 2Select all the files that you want to copy to disc. To select more than one file, press and hold the Ctrl button while you click the files you want. 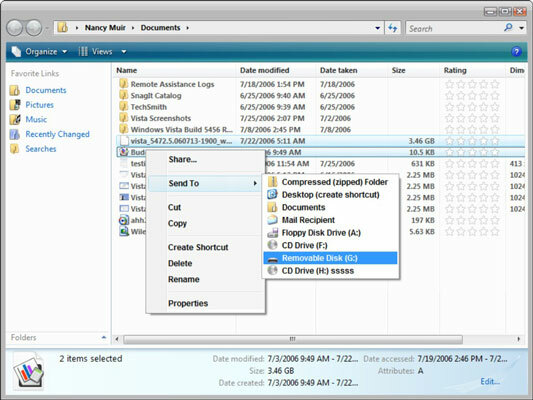 If you want to back up the entire contents of a folder, such as the Document folder, you can just click the Documents folder itself. 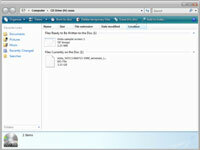 3Right-click the files that you want, choose Send To→, and select the name of your CD or DVD drive. The Burn a Disc dialog box appears. 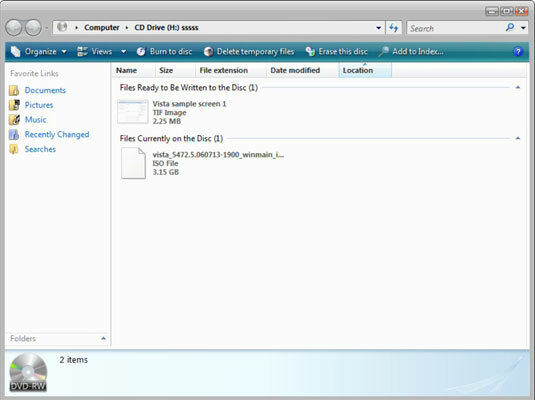 4Enter a disc title and choose Mastered file format from the drop-down list. Click Next. The Mastered file format is more universally readable but requires all the files to be loaded at one time. 5Continue sending any other files you wish to the Waiting to Burn window. Windows Vista will hold all the files you want to save the same way. 6When you've indicated all the files you wish to save, click Burn to Disc. Another Burn to Disc wizard will open, giving you another opportunity to name the disc and set the Recording speed, which is 4 by default. A warning message will appear letting you know that if you proceed with the Mastered file format, you will not be able to reuse the disc to copy anything else in the future. 8If you want to continue with the Mastered format, click Yes. If you want to go back and use the Live File System instead, click No. The default file format is Live File System, which allows you to treat the disc like a flash drive (adding or deleting files at will). 9When the copying is finished, click the Close. Store your backup discs somewhere safe.